This past Tuesday afternoon, I had the delightful opportunity to give a guest talk at the Met. Andrey Sheptytsky Institute of Eastern Christian Studies at St. Michael’s College (University of Toronto). In it, I re-examined the central claim of Time and Despondency, namely the idea that despondency is somehow inextricably tied to a broken relationship to time, in particular the present moment. While I would not take issue with this premise, really all the passions are “temporal.” They exist in time and have a certain way of unfolding and interacting therein. This is beautifully borne out in the writings of Evagrius of Ponticus, whose ascetical texts are replete with references to the timing of passions. 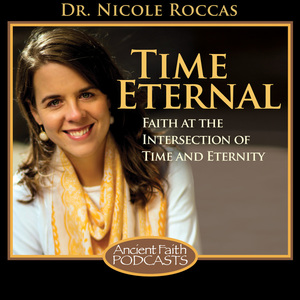 In this talk I talk a closer look at those writings and why it’s vital to understand the temporal context of our deepest spiritual struggles… I hope you’ll watch or listen! If you really want to dig deep into the primary source work, refer to my slides here. To Whom it may concern… please forward this note to Dr Nicole as i don’t have her email… thank-you. You gave wonderful presentation at the Metropolitan Sheptytsky Institute! I was in attendance… and wish to express my gratitude! But just a note of correction regarding an historical mistake in your presentation. If I’m not mistaken myself, it was Pope St Gregory the Great not Pope St Leo the Great who, as you stated in your talk, ‘reconsolidated’ St Cassian’s list of thoughts under the guise of the 7 Deadly Sins used in the West. You’re right about St. Gregory–I’m not sure why I would have said Pope Leo, my mind must have been elsewhere. But thank you for the correction! Have a blessed Lent.